However, the manipulation rubs both ways. Hickey tells the story of a reporter covering the demonstrations surrounding James Meredith’s enrollment at the University of Mississippi. Seeing the protesting students “taut but controlled,” the reporter “leaned from his car and shouted to a group of them, ‘Hey! Where’s the action? I heard there was action going on around here!’” That, of course, did the trick. The students “turned the newsman’s car over and burned it, sending him scrambling; the violence spread from there. At the end of it, two men were dead.” Many think TV played a similar role in the New York race riots of 1964 and the Watts riots the following year. As ABC’s Tom Jarriel says, “There’s no doubt that a camera causes pickets to act up more vigorously. They know the power of TV exposure.” Wherever you have a camera, the journalists agree, you’ll draw a crowd. Whatever happens, Hickey concludes, the answer is not a rigid code, but rather the unwritten “law” of news coverage: that TV should not shape the event through its coverage, and should not allow itself to be manipulated. Only through that self-responsibility can television avoid playing an even larger role in the news stories it covers. It’s first-run for both shows this week, with Ed featuring Yul Brynner, who accompanies himself on the guitar to sing “Two Guitars,” “Sokolovs Guitar” and “Okontchen”; Steve Lawrence and Eydie Gorme*; the singing Kessler Twins; comedians Flip Wilson and Rodney Dangerfield; and the Skating Bredos. *Who just died last month. I didn’t think it necessary to include TV Guide’s notation that she was Steve Lawrence’s wife. Everyone should have known that by now. I dunno. Neither of these lineups sets the world on fire. The Palace is starting the season off on Wednesday night, rather than its traditional Saturday timeslot (to which it will return shortly), and it just doesn’t look right. I’m going to give the nod to Sullivan primarily on the basis of Steve & Eydie, although Yul might have killed with his guitar solos. The football season is in full swing – at least by 1967 standards. ABC’s college football coverage kicks off with the network’s A team of Chris Schenkel, Bud Wilkinson and Bill Flemming in College Station, Texas to cover the SWC matchup between SMU and Texas A&M. SMU wins the game, 20-17, a rare highlight in a mediocre season for the Mustangs, who finish 3-7. The Aggies continue to stumble after this game, starting off the season 0-4 before ripping off seven straight victories to win not only the SEC title but the Cotton Bowl. Channel 11, the independent station, picks up the slack with some small-college football between St. Norbert and St. Thomas, and returns Sunday morning with a condensed version of yesterday’s Notre Dame action. * Actually, it’s a season preview, since the Fighting Irish don’t start until the following week. *I have fond memories of those Sunday morning rebroadcasts, with Lindsay Nelson at the mic. They were great fun to watch after church and before the pro games started. The phrase “We now move to further action” will live forever in the mind of any football fan from that era. Both the AFL and NFL are in regular season form as well. CBS’ NFL coverage varies depending on where one lives: in the Twin Cities and Rochester, where the Vikings home game is blacked out, viewers are treated to the New York Football Giants’ 37-20 victory over the St. Louis Cardinals; in LaCrosse, Wisconsin, the Packers are the home team and WKBT carries the Pack’s 17-17 tie against the Detroit Lions. As for stations in Duluth and Iowa, the Vikings game carries the day – but in a losing cause, as the Vikings drop the season opener to the San Francisco 49ers, 27-21. 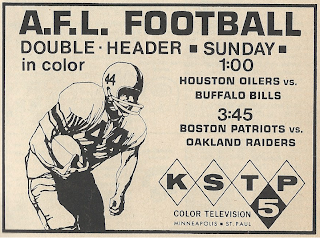 *If I'm not mistaken, that graphic accompanying the AFL game on KSTP looks an awful lot like Floyd Little, #44, who had been drafted #6 that year by the Denver Broncos. Or else it could be Ernie Davis, who also wore that number for Syracuse. No Twins baseball this week, which means they must be on a homestand, since they’re in the thick of the American League’s Great Race. The week’s only TV game is NBC’s Saturday Game of the Week, featuring either Baltimore at Boston or Washington at Detroit. Both the Red Sox and Tigers are embroiled in the battle for first place that includes the Twins and Chicago White Sox. And Wide World of Sports has another of the first-round bouts in the tournament to select a new heavyweight champion. This week, European champ Karl Mildenberger, who fought and lost a title fight against Muhammad Ali last year, takes on Oscar Bonavena in a live broadcast from Frankfurt, West Germany. Heavily favored, Mildenberger loses a 12-round decision to Bonavena; he’ll only fight three more times, losing twice, before retiring. This issue of TV Guide may not be the Fall Preview, but we’ve got plenty of season and series premieres anyway. Jay North, perhaps better known as “Dennis the Menace,” stars in NBC’s short-lived Saturday night adventure series Maya, where he plays a teenager searching India for his missing hunter-father. 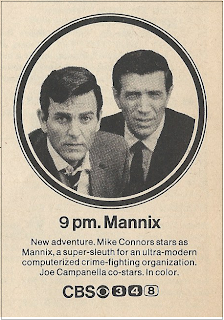 It was off the air by February, 1968. More successful was CBS’ Mannix, which stars the first of its eight successful seasons on Saturday night as well, starring Mike Connors as a throwback private detective working for a computerized agency. 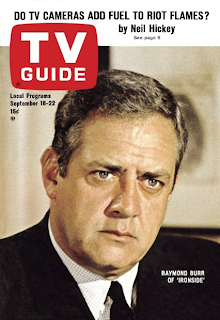 Gentle Ben was a feature of CBS’ Sunday night schedule for two season; interesting to see TV Guide’s note that “Ronny Howard of ‘The Andy Griffith Show’ and series regular Clint Howard are brothers.” On NBC, there’s a pair of Westerns, with Bonanza starting its ninth season, followed by High Chaparral’s first. Other new series include Accidental Family, Ironside, The Jerry Lewis Show, The Mothers-In-Law and The Danny Thomas Hour (NBC); The Carol Burnett Show, Good Morning, World, Dundee and the Culhane and Cimarron Strip (CBS); and The Guns of Will Sonnett, Off to See the Wizard, The Flying Nun, The Second Hundred Years, Custer, Garrison's Gorrillas, NYPD, Coyboy in Africa, and Good Company (ABC). The famed stripper Gypsy Rose Lee* tries her hand at talk with her new half-hour syndicated chat show, directed by future Oscarcast producer Marty Pasetta. Gypsy’s constantly at odds with the producers over her desire to discuss topics such as cancer, cosmetic surgery and prostitution, and her proclivity to be, shall we say, free with her language. The show was never aired live but always taped, giving producers the chance to blip out any objectionable language. Lee once complained that she was even blipped for talking about damming a river. *Fun Fact: Gypsy Rose Lee’s younger sister was movie star June Havoc. Finally, on September 10, ABC preempted its entire prime-time schedule to present a four-hour documentary entitled "Africa: A Journey to Discover the People and the Land That are Africa Today," narrated by Gregory Peck with additional commentary from ABC newsman Howard K. Smith. Now, a week later, ABC repeats the series in four weekly one-hour broadcasts. The interesting thing: the air time is 8:30 CT Tuesday morning. I can only think that the network’s trying to reach an audience that wasn’t available the previous Sunday night, offering the show to homemakers hungry for something more substantial than game shows, soap operas and Gypsy Rose Lee. The second game of that AFL doubleheader was the Raiders beating the Patriots 35-7. (Your post says Chargers and has the wrong score)... Ernie Davis died in 1963 so I'm quite sure he is NOT the subject of that photo. Score now fixed. I'm not sure about Ernie, though. The ad is clearly an illustration based on a file photo, and the pose and uniform design are strongly indicative of Syracuse, meaning that it could be Floyd Little (or even Jim Brown, I suppose), but it could also be Davis. Per the discussion from a couple of weeks ago regarding Lou Gehrig's number, I'm quite sure Channel 5's ad agency wouldn't have had the vaguest idea who Ernie Davis was. Also, I have a question regarding your statement that all NBC stations carried the 2 games mentioned in the KTSP ad. Does your issue of TV Guide specifically state that? The reason I ask is because the sports broadcast history forum on the506 shows NBC covering a total of 3 games that day with regional coverage of Bos-Oak and Den-Mia in the late slot. I am not claiming that the506 is correct - I honestly don't know. And recent research has shown that a number of AFL games went untelevised which were previously listed as NBC games on the506. But I am very interested in the basis of your statement and any evidence you can provide from that TV Guide edition regarding the exact nature of that NBC AFL coverage. All the stations in the Minnesota State edition - KSTP (Channel 5) in Minneapolis, WDSM (Channel 6) in Duluth, KCMT (Channel 7) in Alexandria, KROC (Channel 10) in Rochester and WEAU (Channel 13) in Eau Claire, WI had the same doubleheader lineup. Since we're only reviewing this specific TV Guide, for our purposes and using the terms of reference specific to this feature, "NBC" means all the NBC affiliates in the Minnesota State edition. Irma Philips actually quit LOVE IS A MANY SPLENDORED THING because CBS wouldn't allow her to use the novel and film's theme of interracial romance. Don't forget that the rescued GUNSMOKE and the recast MISSION:IMPOSSIBLE gave CBS another set of brothers...James Arness and Peter Graves.